The Double: Rob Jelly takes home two awards for his contribution to the senior Offense. 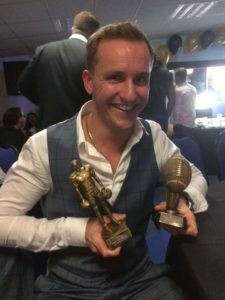 The three Essex Spartans teams celebrated a successful 2017 season with their annual Awards Evening on Saturday 21st October. It was a great evening for Under-19 player Ed Clark who picked up two awards, Special Teams MVP and Players’ Player of the Year voted for by his peers. Also taking home two awards for the Academy was Under-17 Aidan Langan whom won Players’ Player of the Year for the U17s and Overall Team MVP, whilst his brother Firenz won Defensive MVP for the U17 team. Also winning a double in the senior ranks was WR/QB Rob Jelly, taking home Offensive Most Improved Player and Offensive MVP. Joining Aidan Langan in the Overall Team MVP categories for U19 was Lewis Hall and Nick Walter for the seniors. All three teams will start recruitment again in November; anyone interested in joining should email info@essexspartans.co.uk and follow our social media for Come and Try dates.